We all need a little support at times, and that’s the thinking behind Elle Milk Compression Open Toe Socks, made to the highest standards in Italy from a blend using a unique Lanati milk fibre mix, which uses actual dairy milk protein for fabric that is moisturising, anti-microbial and sanitising for healthy skin. Elle Milk Compression Open Toe Socks are designed for daily wear by anyone, supporting circulation by applying a mild to moderate degree of graduated compression (up to 22 mmHg) preventing you from, and reviving, tired legs, swollen ankles or aching feet. They are useful for sports, outdoor activities, long distance travelling or long periods of standing. 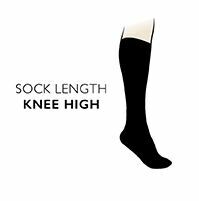 The socks have a soft, luxury feel with a slight silky gloss, comfort ‘stay-put’ cuffs and reinforcement at the heels for durability. Whole foot and footless versions are also available, all with the Elle logo at the cuff.